Thanks for using BriefCatch! Here are some quick tips on how to get the most out of the product. What documents get the most benefit? BriefCatch subscribers range from U.S. Supreme Court Justices to law students and from corporate executives to scientific experts. It works well with later-stage drafts of any substantive Word document, whether informative or persuasive. It’s not designed for literary writing, however, and it won’t help much with simple emails. 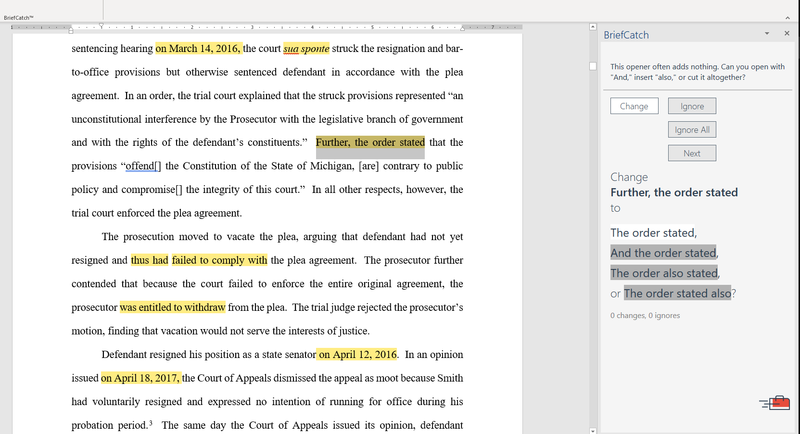 Open a Word document and click on the BriefCatch tab. If you want to run the whole document, that’s the default. But if you want to run just part of the document, feel free to select it as you would select any other text. Either way, click on the “Catch” button in the upper left. And give BriefCatch a few moments to flag editing opportunities in yellow. First, you can turn on Word’s Track Changes if you want to show your markup. Next, to get a sense of what kinds of changes are in store, you can start with the first highlighted text, look at the User Interface on the right, and go from there. Or you can click on any highlighted text and see what the User Interface suggests for that item. If you like the first (or the only) suggested change, just click “Change” and BriefCatch will make it for you. If you prefer another one of the suggested changes, just click on that one. If you want to leave the highlighted text as is, just click “Ignore,” the highlighting will disappear, and Catch will move on to the next highlighted text. If you’re not sure what you want to do and would like to come back later, click “Next.” Catch will move on, and the highlighting will remain. What if I want to clear the highlighting? Just click “Clear” in the upper left. “Save as” also clears the highlighting. What if I want to ignore an entire category of edits? If you don’t want to make ANY changes in a given category (if, for example, you don’t have time to worry about the passive voice or about long sentences or you aren’t concerned about having too many complete dates), click “Ignore All” any time that issue is flagged and all related flags in the document will disappear. What if a suggestion just doesn’t seem to work, or if I know it would work but I just don’t want to make it? Don’t make it! You should trust your judgment. Does BriefCatch try to edit quotations? BriefCatch is designed to ignore quotations, but formatting irregularities can lead it to flag quoted language from time to time. Just ignore it. Why do you have stats and scores, and what do they mean? The BriefCatch scoring system has become one of the tool’s most popular features. But you can get a lot out of BriefCatch without ever generating your scores. Just following the suggested changes will improve and tighten your writing. You’ll get more information about the five scores and what they mean if you click on the Stats function. 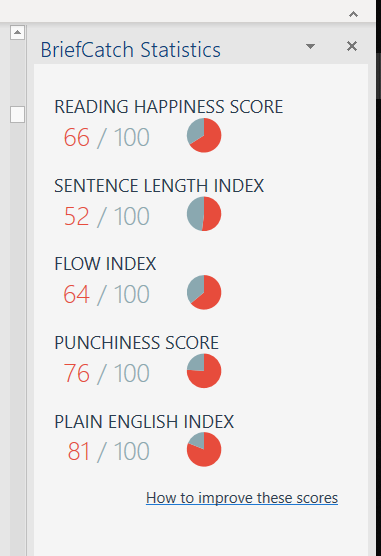 The stats are empirically derived measures that generate five scores from 1 to 100 based on how much your writing style resembles that of renowned writers. 100 is the top score. Scores over 90 are rare. In general, though, they are empirically derived measures that generate five scores from 1 to 100 based on how much your writing style resembles the style of renowned writers. 100 is the top score. Scores over 90 are rare. Can I get any other global feedback? The Report feature instantly generates data on an entire document along with relative strengths and weaknesses. You can click on Report as many times as you want before, during, and after editing. How can I see if my writing improves? 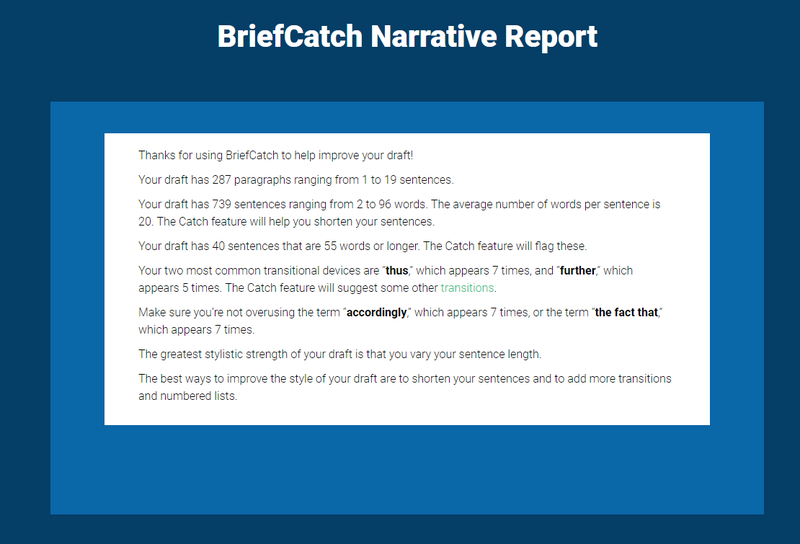 Many BriefCatch users report that they start “hearing” the BriefCatch flags and explanations as they type a new document, saving them time and improving the quality of their documents right up front. One thing to look for: Are you spotting new issues or opportunities in your drafts? Also look for patterns in Stats and Reports if you use those features. Thanks, and contact us through the Feedback button, or by submitting a ticket, if you need help or want more information.